Away from the Strip and the I-15 corridor, the extensive western suburbs of Las Vegas (including the town of Spring Valley) stretch for ten miles towards the foothills of the Spring Mountains. This area is predominantly residential, containing many upscale estates on the flat, gently sloping land, some based around country clubs and golf courses such as Canyon Gate, Siena, Spanish Trail and Arroyo; the most exclusive are those on the western edge, as they have the best views of the city. Loop 215 runs all around the perimeter, while US 95 and the Summerlin Parkway cross the center; other main roads, with shopping and lodging, include Sahara Avenue, Charleston Blvd, Flamingo Road and Rainbow Blvd. 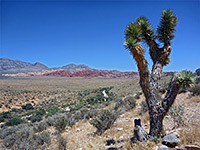 This part of Las Vegas is very close to Red Rock Canyon National Conservation Area, one of the most visited natural areas in the state, while the road to another popular location Mount Charleston branches off US 95 a few miles north. Considered one of the top hotels in all Las Vegas, the 545-room/suite JW Marriott Resort is surrounded by 50 acres of landscaped desert towards the west edge of the city in the Summerlin area - about half way (ten miles) between the Strip and the unspoilt scenery at Red Rock Canyon. The luxurious, well managed resort has an AAA Four Diamond rating and provides comprehensive facilities for leisure, business, meetings and events. Amongst the many highlights are 11 restaurants & bars, a casino, a large pool complex with waterfall, cabanas & bar, the TPC Las Vegas golf course, the Aquae Sulis Spa & Salon, and 100,000 sq ft of meeting space. With an easy-to-reach location along US 95 in northwest Las Vegas, Courtyard Las Vegas Summerlin is centrally positioned for all area attractions, including Red Rock Canyon (12 miles west), Lake Mead (28 miles east), and the casinos of the Strip, 10 miles to the southeast. The hotel has the expected Courtyard qualities of new, modern decor, clean, spacious rooms, and a well kept patio garden area with outdoor pool and hot tub. Breakfast (not free) is available from the Bistro restaurant on the premises; the adjacent lounge serves evening drinks and snacks. There are plenty of shops and other restaurants within half a mile to the north. The Hampton Inn is a northwest Las Vegas hotel, along US 93 in the Summerlin district, within a mile of such locations as Cheyenne Commons Mall, Mountainview Hosital and Doc Romero Sports Park, plus several golf courses and many corporate buildings. The north end of the Las Vegas Strip is ten miles away. The hotel provides free hot breakfast, available in a take-out version for guests in a hurry (Mon-Fri), together with free tea & coffee in the lobby. Guests here to work can take advantage of a business center and a 25 person meeting room. All accommodations contain a refrigerator and microwave. West-facing rooms at Hampton Inn Las Vegas/Summerlin have fine views of the Spring Mountains and the colorful cliffs of Red Rock Canyon NCA, the main entrance to which is just ten miles away. In the other direction, a quick drive all along Flamingo Avenue reaches the Las Vegas Strip after 7 miles. The 106 room/suite hotel is part of an extensive shopping/dining/entertainment complex right on the southwest edge of the city alongside Bruce Woodbury Parkway, and it enjoys a quiet setting, 700 feet away from the freeway. Amenities are free hot breakfast, free wi-fi, a pool & fitness center, a 24 hour business center and meeting space for 35 people. Towards the southwest corner of Las Vegas, the new Holiday Inn Express I-215 opened in 2006 to serve the quickly expanding suburbs of this part of the city. 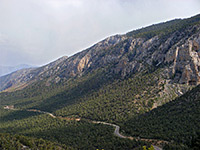 The hotel has partly rural surroundings though it is only 4 miles from I-15 and 9 miles from the international airport. Exit 15 (S Rainbow Boulevard) of the 215 beltway is 2 blocks to the south, while a short distance north are various restaurants and shops. The Holiday Inn Express has a particularly good reputation, for its efficient staff, modern design & decor, cleanliness, and the facilities - which include a free airport shuttle, fitness center, outdoor pool, hot tub, free continental breakfast, guest laundry and a meeting room. Best Western Plus Las Vegas West is a recently renovated boutique hotel near the community of Summerlin, towards the western edge of greater Las Vegas along Sahara Avenue. This is an upmarket residential area, and nearby attractions include the Canyon Gate Country Club (just the other side of Sahara), Badlands Golf Club, Tournament Players Club at Summerlin, and the Angel Park Golf Club. The three floor hotel has 59 rooms, an indoor pool/whirlpool, exercise facility, newsstand and facilities for meetings/business. As well as standard dooms, several types of suite are available - some with a kitchenette, others with a whirlpool bath. Free full breakfast is served.